מאת יובל ~ 1 ביולי, 2010. בקטגוריית: English, ארגנטינה, יין, יקבים, מדריכים. After only 6 hours of sleep (and sparkling wine still in my veins) I woke up in a very good mood and was already on a bus to Maipú at 8 in the morning. As soon as Hugo laid his eyes on me he went into his house and brought out his crown bike for me, what a good guy. I was given my water bottle and off I went, another day of riding through the Mendozian country side visiting wineries. This time I took Juan José Paso Road and crossed Rt. 40 until the famous San Martín Avenue. 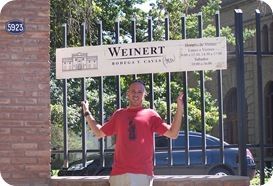 I took a left and arrived at Bodega Weinert at 9 in the morning after a 20 km or more bike ride. 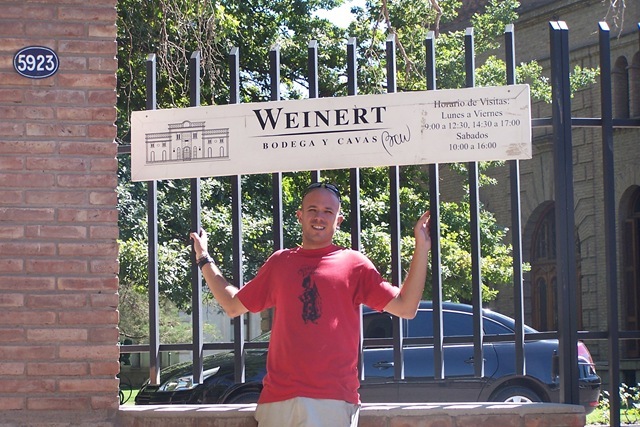 Weinert – Bodega y Cavas is a German owned winery with Brazilian ancestry. I walked in and expressed my interest in having some tastings. Since I was the only one there and so early in the morning, the nice girl suggested to taste all the wines she had open. A total of 9 wines, okay with me. We walked down into the wine cellar and after all the wines were brought out and poured, I starting drinking them one by one. 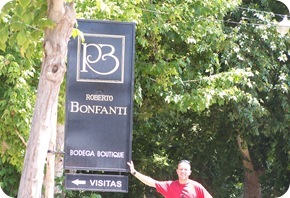 While drinking I asked about the winery's history and its worldwide business. Most red wines were fruity but with a dry aftertastes. I liked the white wines better. A nice white wine was their Chenin Blanc 2003 which had a nice light whiskey color. 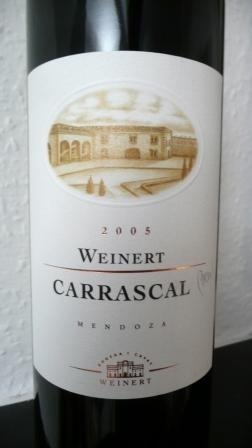 The wine had great aromas of apple, maple syrup and caramel; together with a light raisin flavor. Since the tastings didn't cost anything I decided to buy another wine bottle opener (my 7th). I said "Muchas gracias." and continued on. I had a 10 o'clock reservation at my next winery. in English. Since this is going to be a fairly easy-to-understand tour, I asked Chrissie to enlighten me about the winery's history. In short, the family's history is more about "gauchos" and not about wine. A truly interesting history beginning with horses and finishing with great wine. To my surprise all tastings were going to be either straight from the barrels or the stainless steel tanks. The first wine was a barreled Syrah 2005. The wine has amazing cherry ginger and oak aromas, with flavors of sweet cherry and plum. The wine was nice and round but with a sour finish. The next wine was a Malbec 2004 from a stainless steel tank. This Malbec has a special dark chocolate aroma together with a round plum-berry flavor. The last tasting was a Gran Reserva Malbec 2003 from the barrel. 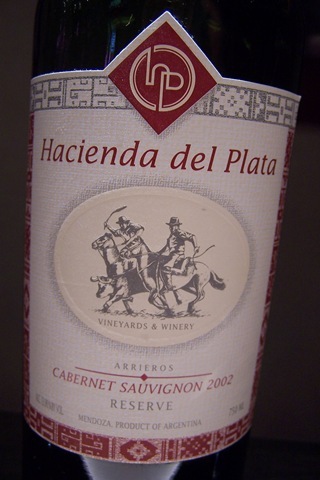 The wine has a dark intense ruby color with aromas of oak, tobacco and fresh prunes. The wine had an oaky leather and a strong plum flavor, with a full body and smooth fruity finish. The Gran Reserva was definitely my favorite of the three wines. I expressed my gratitude to Chrissie for the great informative history and the great wines. 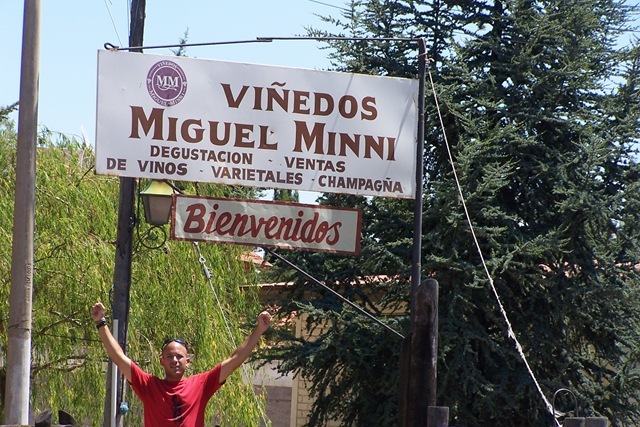 I noticed that I was going to be late for my next reservation so I decided to continue straight to my next one, Miguel Minni. I guess I missed a turn because I arrived at the bodega that I wanted to give up. I dismounted my bike and walked into Cabrini – Viñedos & Bodega. The girl at the counter wasn't so friendly but I still received a couple tastings. Both Malbecs were average and really nothing special. I thanked the girl and rode back north on San Martín Avenue. I turned right on Maldonado St. and then left on Terrada St. 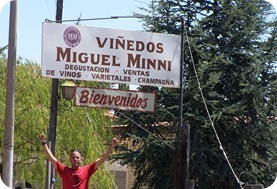 I arrived at Viñedos & Bodega Miguel Minni only 20 minutes late. I parked my bike in the shade and yelled a few "Holas". I walked behind a building and arrived at a sliding glass door. I knocked on the door but nothing happened. I knocked again with the same result. I knocked again, and this time slid the door open and popped my head in. Nobody was there to greet me. It was a nice little room with wine bottles and glasses with a couple small tables and chairs. I realized that here I will not get any tastings today, so I slid the door closed… and that's when all hell broke lose. The alarm went off and the light and sound effects started to work at full volume. With all the lights going off it would have been much more impressive at nighttime. I walked around to the front to meet whomever was going to come out, but all I met were the barking local gang of dogs. I tried to explain what happened, but they wouldn't listen and kept on barking. I stood there for about 10 minutes while the alarm was still working, and still nobody came over, not even the neighbor. After the alarm stopped I waited for a few more minutes, but again nobody showed up. 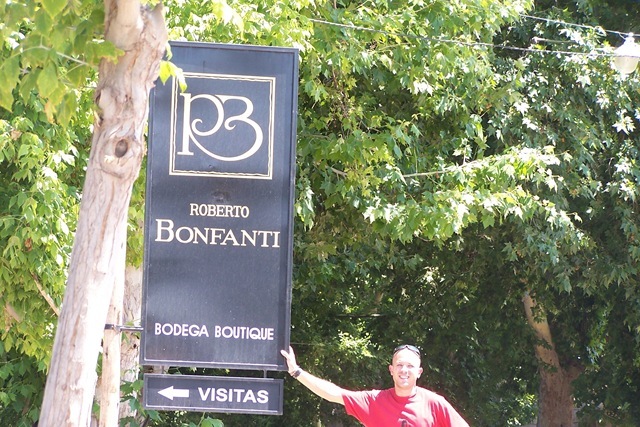 Luckily, right across the road was Bodega Roberto Bonfanti. 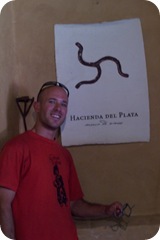 I walked up the dirt path and was met by Alejandro. I asked if he had enough time to give me a small tour and tastings. He said he had no problem, he had all the time in the world. 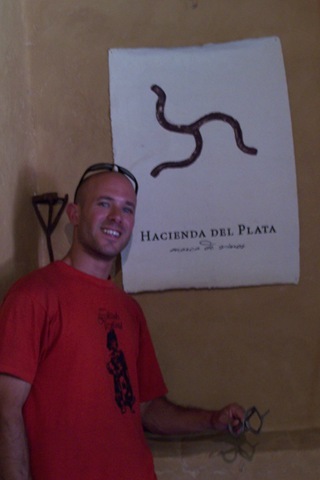 I like people like Alejandro, easy going and down to earth. 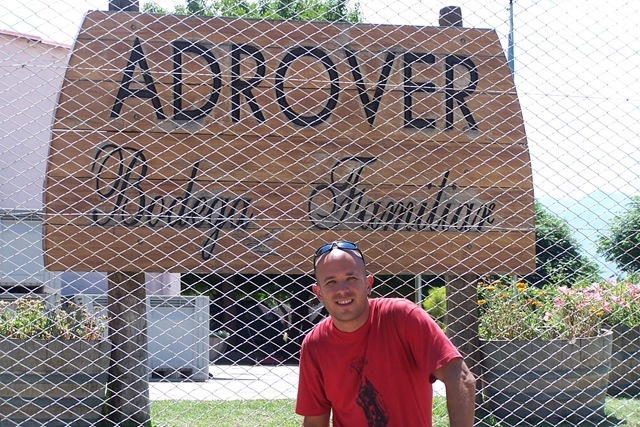 Alejandro gave me a small tour of their winery. After the tour we climbed back up the stairs and sat in a medium sized room with huge windows all around. After all the bike riding I was glad to sit in a cushioned comfortable chair. Even though I didn't like rosé wines, this was the first wine I tasted, a Malbec Rosado 2007. I didn't only like its strawberry mandarin color, but the aromas and flavors as well. It had great aromas of wild berry, strawberry, and orange; together with flavors of orange plum and berry with a fruity berry finish. The Rosado was also served chilled so I enjoyed it immensely. The next 2 wines were also very good, a Malbec 2005 and a Cabernet Sauvignon 2005. 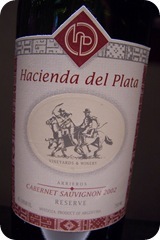 The Malbec had a unique nutmeg aroma with a round smooth fruity finish. The Cabernet Sauvignon had a special floral and black pepper aroma, together with a coffee flavor and a round fruity finish as well. I thanked Alejandro for the good time and kept on going. I walked back over to Miguel Minni but nobody was there. I decided to start riding back north. I stopped at Ardover – Bodega Familiar but they don't have any tours or tastings. A few kilometers up the road on San Martín I stopped again at Bodega Lagarde but it was closed today. 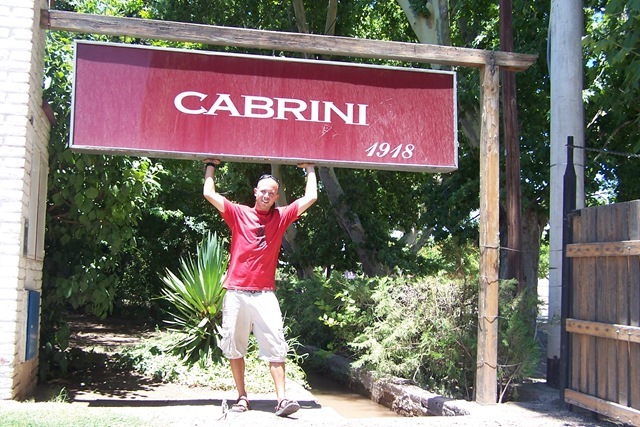 I decided to ride back to Maipú. I arrived fairly late at Hugo's shop but I guess nobody cared. 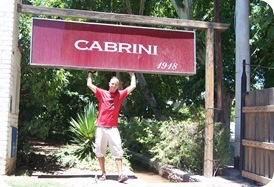 While waiting for the bus back to Mendoza I thought about the exceptional day that had just past. It was one of many great days visiting wineries with more similar days to come. יובל, הכתבות שלך טובות ועושות חשק לחזור לארגנטינה ולהשלים את החלק של מנדוזה שלא הספקנו. אני רואה שאתה כבר ביום השביעי ועדיין רץ מיקב ליקב ושותה. אני ביום השלישי קיבלתי כבר סחרחורת רק מהתיאורים.